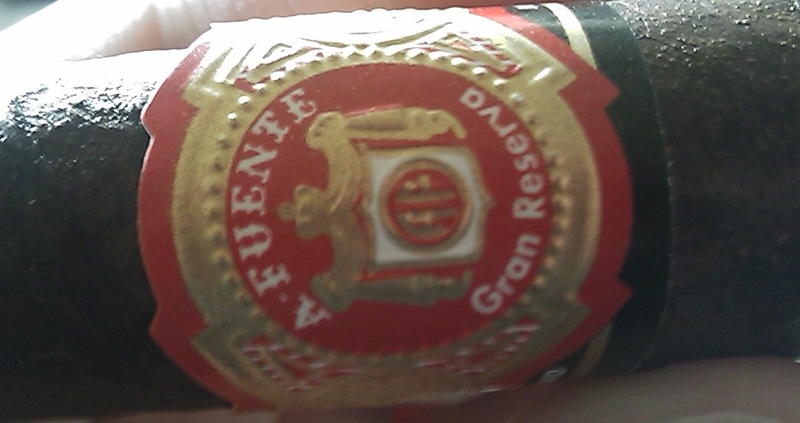 A rare holiday cigar put out by the Fuentes sure is a great treat. This is the WOAM as most people call it and is a Work of Art as it is called. A very toothy dark and sweet maduro wrapper give this cigar a wonderful appearence. It is nice and firm in the hand with superb construction. The flavors are of sweetness and pepper. The draw is flawless with ample amounts of smoke. As I got to the 2nd third I noticed quite a bit of pepper and some chocolate flavors… mmm, this was getting good. The last third was smooth with some creaminess and mellowed out for me. These sticks are good but I would prefer the Anejo shark #77 or a hemingway signature maduro. As I sat and relaxed with this great stick I thought about the wonderful Thanksgiving I had and the many things that I am grateful for. My health and my family… as I heard today on Cigar Pass that one of the great one’s passed away. Infinity as he was known on CP, Brian to the rest of the world was a great BOTL and a great guy who will be missed. I will light up a cigar in his honor this evening and wish everyone out there to keep his family in your thoughts and prayers. This entry was posted in A. Fuente and tagged A.Fuente, anejo, Art Maduro, broadleaf, dominican republic, hemingway. Bookmark the permalink. You said “[t]hese sticks are good but I would prefer the Anejo shark #77 or a hemingway maduro.” I always thought the Work of Art WAS Hemingway. You are right, I meant a Hemingway Signature. I like the larger vitolas. I haven’t had the WOAM but I have had the Short Story and that is an awesome cigar. Anything the Fuentes make is good… usually.